I have been building this sequencer for quite a while now and I thought I show it off and start describing how it was done. I will be updating this in the weeks to come with more information. If you want to attempt building one of your own, there is nothing particularly difficult, but wiring and hooking up all the front panel controls is definitely tedious. Next version I build will probably have panel mount controls to avoid spending a month wiring everything up. That is amazing - I think I want one! Only thing is I can't see a CLOCK input - is it possible to clock it from another module's pulse output, eg LFO etc? Full external individual clock per row support is on the panel, but I haven't hooked it up and added software support for it yet. Go On the bad producer ! Yes i enjoy it much! I hope you'll offer it in a Short time cause i'm very impressed! Wow, that is amazing! 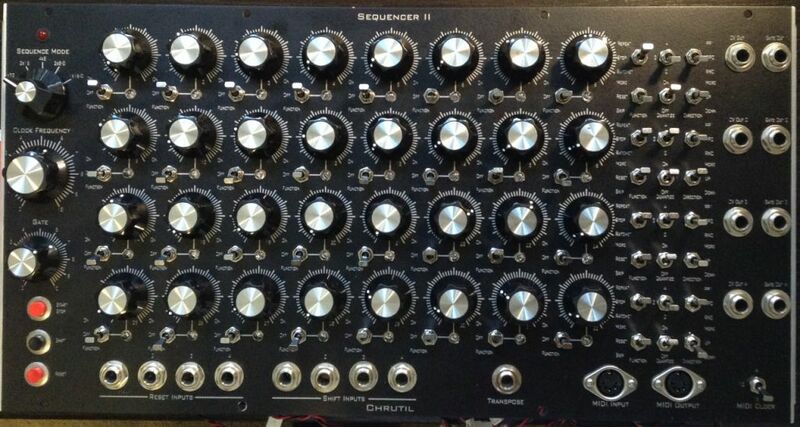 I figured that would be just what I was looking for in a sequencer, until I saw the back! Yikes! This is beautiful - I would love to see the schematics. 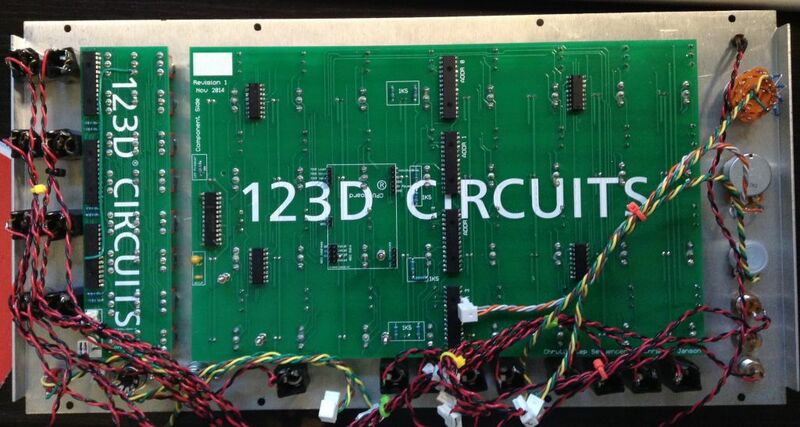 A Panel PCB (or file for said PCB) for soldering pots, switches, and LEDs would be amazing too. Really excited to see more things done with it. Yes I've had tons of fun with this one. To the point where my plans started to gel around building three more. The wiring on it was pretty painful though - okay to do once, but not four times so I started sketching on rev. 2. I've got lots going on at work right now so this won't be done in the next month or so, but I'm hoping for spring to have it up and running. Will post progress as it happens. Thats so Great! I would (must) have one or two!!! Congratulation a Very good job! 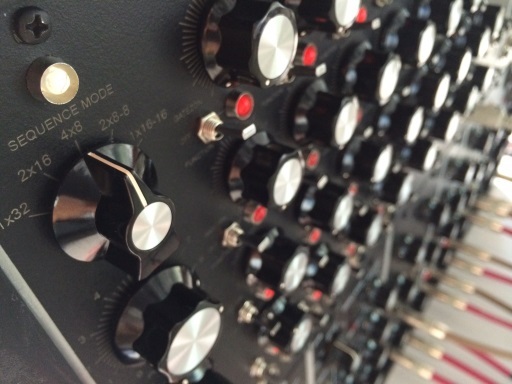 wow,awesome project,4 rows,quantized and midi..
hope you will offer kits ! Mind reader! I thought about making an Arduino based sequencer myself, inspired from the Moon sequencer (which is really nice). I was wondering though, how is the progress with rev.2? And what changes are you going to make to it? Would you think possible to add slide and maybe accent, for 303 sound like? Unfortunately I botched the cpu board for the second revision of the sequencer, so I have to redo it - I tried to rush it and ended up with too many problems on it to be able to "fix it in post", so I'm redesigning it and will make a new batch. It's taking a little bit of a back seat position since I'm also working on a 2MU real-time/step sequencer thingy that I discovered I couldn't live without. The rev 2 looks really nice though, to make things a little faster the brain is now a Teensy 3.1. I also added front panel switches for Ratchet and Repeat and a switch to set 2, 3 or 4 repeat/ratchet counts, and I also added two different ping-pong modes for direction and a switch for some midi clock options. I did the second panel before our revered JLR showed us how clever and cool per-channel transpose on/off switches are, so four on/off switches for transpose are are added to the third and fourth panels (building four of these). Panels 3/4 also has two gate and two CVs per row so to eliminate a multi for driving two oscillators/envelopes. I also found a use for the two remaining sequence modes. Now there are the standard 1x32, 2x16 and 4x8, then thew two remaining ones are 2x8-G and 1x16-G where each note has two knobs, the first row defines the voltage and the second row defines the gate length per note. Since I have yet to complete the redesign of the cpu board and I'm designing another sequencer in between, etc, a finished version is probably two months away or so. I don't know about kits, but if I don't make kits I'll surely provide schematics/source. Oh, and for tekzon - for accent and glide I'm running out of real estate to put anything on the panel, but I think I would do accent using a parallel row going to the filter and/or vca, and the glide could be done, I'm speculating, with a gate channel going to the control input on a slew limiter. A small suggestion, how about the gate knob assignable, so that you can use it for gate lenght or shuffle-beat? I doubt there's space for a dedicated knob for shuffle..
Interest, do you have a BOM, pcbs? I guess I got either too confident and sloppy, or too eager to have it so the PCB second revision ended up having problems that I couldn't really fix in software so I decided to step back and redo it. At the same time I switched to using Eagle CAD so I also had to learn a new tool, but the PCB's are finally designed and I'm going through trying to validate the designs and breadboard or simulate some of the stuff I'm unsure about before I order the PCBs. Having some time off this summer so I'll be spending some time on it again in a month or two, but nothing imminent. I just stumbled upon this on youtube, and I have to say this sequencer is excellent. Everything I need in one sequencer without having to use two or three additional modules. 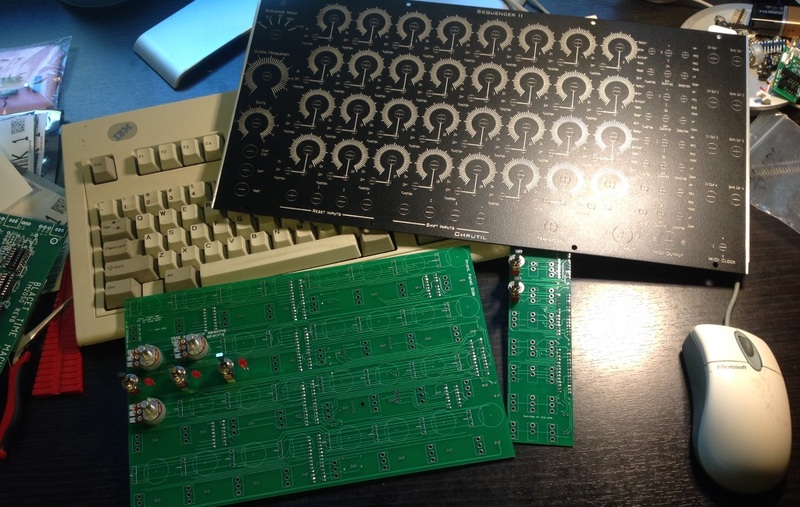 Definitely interested in future PCBs. While browsing through the SDIY bookmarks in my Firefox i stumbled on your website and i was wondering if there is something new on this very nice and intriging project. are there any updates on this? Would love to build that sequencer. Your files on circuits.io are not the latest / finished versions, are they? Yes thanks for making me feel bad about dropping the ball on this. The Rev 3 sequencer works works well enough to use it, but still has some issues I need to fix, but haven't tried to resolve yet.